While we don’t usually have the same band appear at Croxfest two years running, they were so good last year playing to a smaller crowd in the pouring rain we’ve invited them back so more of you can enjoy them. With so many tribute acts and compilation albums using the same songs, you would be forgiven for thinking that there were only ever 40 tunes produced during the 80s. But anyone who was a child of that time will know that there were many more excellent songs written in that decade than those you tend to hear nowadays. 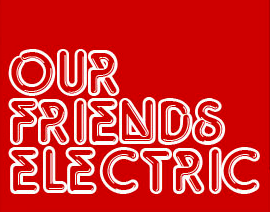 And that is why Hertfordshire based Our Friends Electric are different to other 80s bands. In a homage to the synthesiser, we specialise in playing those often-eclipsed tracks and seminal classics that no self-respecting 80s aficionado would not fail to recognise – those cult songs that could guarantee to fill the dance floor at any 6th form disco and that were such a REAL part of our growing up.